After the opening of Barnet station (as it was called until 1884), roads were laid out on both sides of the railway tracks, though house­building proceeded very slowly along them at first. Formed in 1866, the East Barnet Gas and Water Company built a gasworks on Albert Road and sank wells beneath what is now Artesian Grove. Within a few years a clear distinction had arisen between the villas erected for the middle classes on the higher slopes to the west and the working-class housing and shops east of the tracks. Many of the latter homes provided domestic servants for the former. The grandest estate was Lyonsdown, to the south-west, laid out in the grounds of the former house of that name. Elsewhere, most of New Barnet had hitherto been meadowland. The pace of suburban growth accel­erated at the turn of the century, due in large part to the efforts of the entre­pren­eurial estate agent and specu­lative developer, E Fergusson Taylor, who has been called ‘the creator of New Barnet’. Taylor marketed his properties with a vigour that could make modern practi­tioners blush, as well as lobbying for the construction of churches and chapels – and promoting a temperance hall and coffee house that might divert drinkers from the Railway Bell, Black Boy (now Lord Kitchener) and Railway Tavern. In 1891–2 the East Barnet Valley local board built an Italianate town hall on Station Road (originally called New Barnet Road) and the station was wholly rebuilt in 1896. 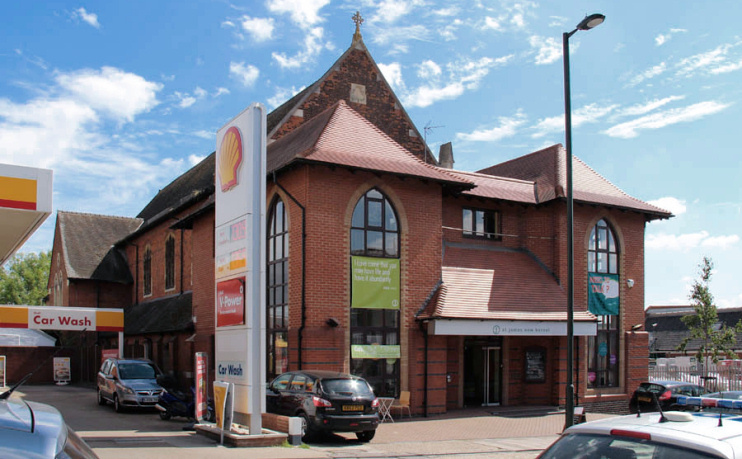 On East Barnet Road St James’s church was consec­rated in 1911. By the outbreak of the First World War, New Barnet’s devel­opment was almost complete. 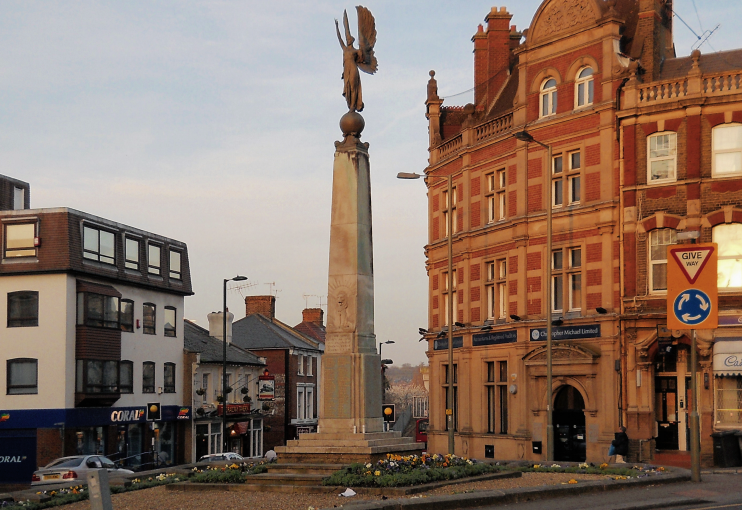 Shown in the photo­graph at the top of this article,* the district’s lofty war memorial was unveiled opposite the Edwardian bank in March 1921. In the early 1930s John Ward estab­lished a ‘folk park’ – an open-air museum – in the grounds of a large stuccoed house at 89 Park Road, where New Barnet meets Cockfosters. A medieval tithe barn was brought here from Birchington in Kent (where it had been in the way of some bungalows that needed to be built) and installed in the garden. (Click here for a Bing bird’s eye view of the house and barn.) Ward converted the barn into the mother church of his religious confra­ternity, the Abbey of Christ the King – but he was bankrupted by a 1945 court case in which he was found guilty of enticing a 16-year-old girl away from her family to join the mystical sect. The house was then sold to the Mayfair art dealer William Ohly, who turned it into the Abbey arts centre – a gallery, museum and commune that became a base for expat­riate Australian artists. The gallery remained open until 1977, latterly under the ownership of Ohly’s son Ernest. The folk park’s exhibits later formed the nucleus of the collection at the Abbey museum of art and archae­ology in Queensland, Australia. Several office blocks were built on Station Road in the 1960s and 70s, plus a couple more on East Barnet Road. Some have since been converted to or replaced by flats. The most egregious 21st-century apartment block is Station Road’s Comer House. As shown in the photo­graph above, St James’s has been endowed with an extension that only half matches the original. This might have been regret­table had the building been more beautiful in the first place. Following a ten-year spell as a restaurant, the town hall was converted into flats in 2006. Major resid­ential devel­op­ments are presently afoot on sites that had previ­ously been earmarked for Asda and Tesco super­markets. The larger scheme is at the disused gasworks, which is likely to become the Victoria Quarter, with around 300 new homes. * The picture of the war memorial, New Barnet, at the top of this page is adapted from an original photograph, copyright Paul Bryan, and the picture of St James, East Barnet Road, is adapted from an original photograph, copyright John Salmon, both at Geograph Britain and Ireland, made available under the Attribution-ShareAlike 2.0 Generic Licence. Any subsequent reuse is freely permitted under the terms of that licence.